Happy Vegan Month of Food! Let’s start with some cake. This cake is so good and so easy. There are a million recipes for the cake. 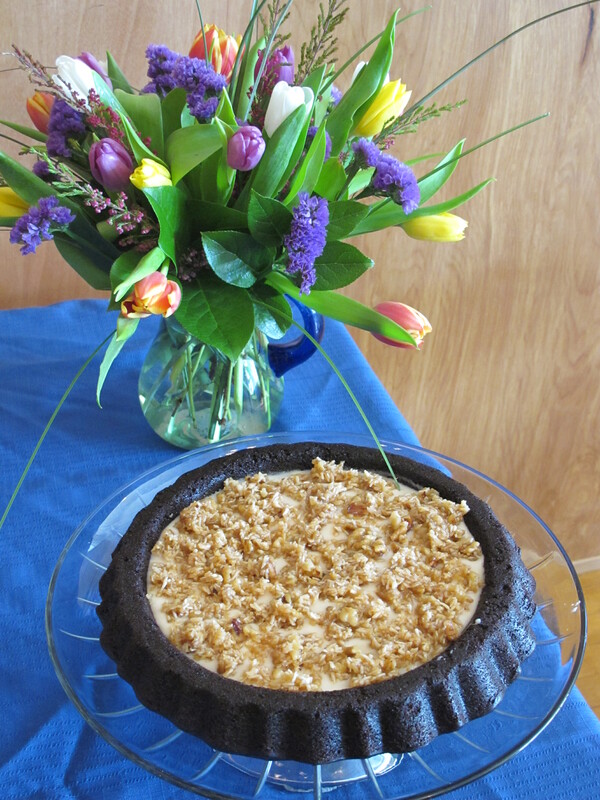 Those Depression-era recipe testers have given us great egg-less, dairy-free chocolate cakes. I have lots of variations, but for the base of this cake, please refer to either this one given to me by friend, Caitlin, Or this one that I modified from a recipe in Bon Appetit. I love making this cake for birthdays–and it is also my birthday cake of choice. I made it for our last supper club to celebrate friend Beth Leeson’s birthday, and I got several requests for the recipe. After you make and bake your chocolate cake of choice, here’s the topping (which I have modified slightly) from the Chicago Diner cookbook to use less Earth Balance and more other ingredients than called for. If you don’t have barley malt (which I didn’t recently), see the substitution below. The big trick here is to quickly spread this on your cake. It really does firm up quickly, so have everything ready. 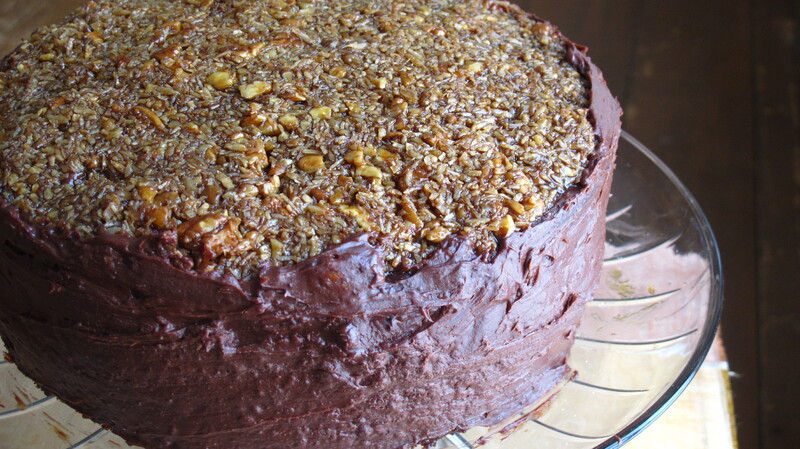 You can use the chocolate frosting provided in Caitlin’s recipe on the outside of the cake, or you can choose to be more authentic and just use the coconut-pecan topping. Either way it is delicious. In an iron pan, dry toast the coconut by placing it in the pan and stirring over medium heat. Stay around and watch it. When it begins to turn brown and you smell a nice nutty aroma, remove from pan and set aside. Melt margarine in a small heavy-bottomed pot over medium heat. Add sugar and barley malt and stir until incorporated and sugar is melted. Add other ingredients and stir until well mixed. Divide in half and smooth half over each cake layer. Start by mounding in the middle and spreading outward. This requires a delicate touch so you don’t tear your cake, but it’s the only challenging part. You can do it! Especially for this delicious result. Thank you, Chicago Diner! We love you! This looks delicious! I think I’ll make this for my sister-in-law’s birthday at the end of October. So happy to connect with other Michigan Vegans! If you are close enough come to one of our supper clubs! 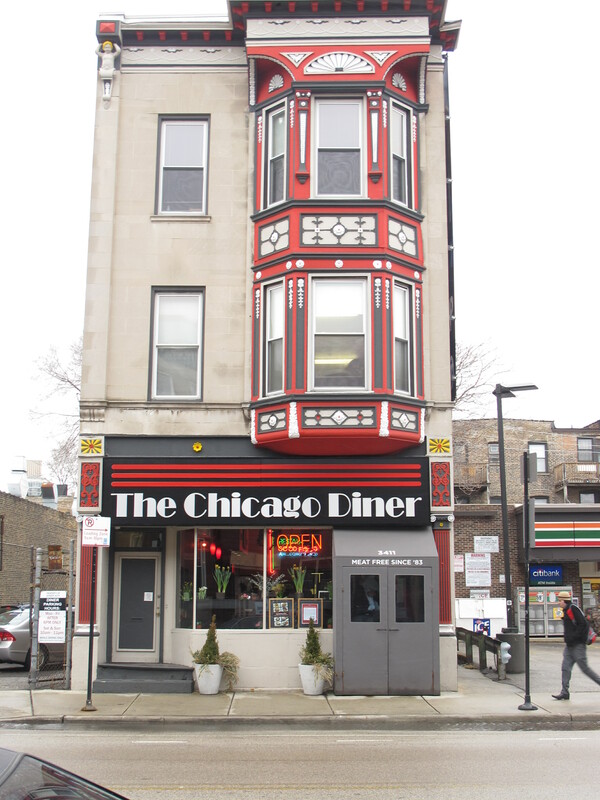 This cake does look decadent and delicious and the chicago Diner building is amazing! Oooh yes please. I’ve wanted cake extra bad lately. What an amazing recipe! Thanks for sharing. 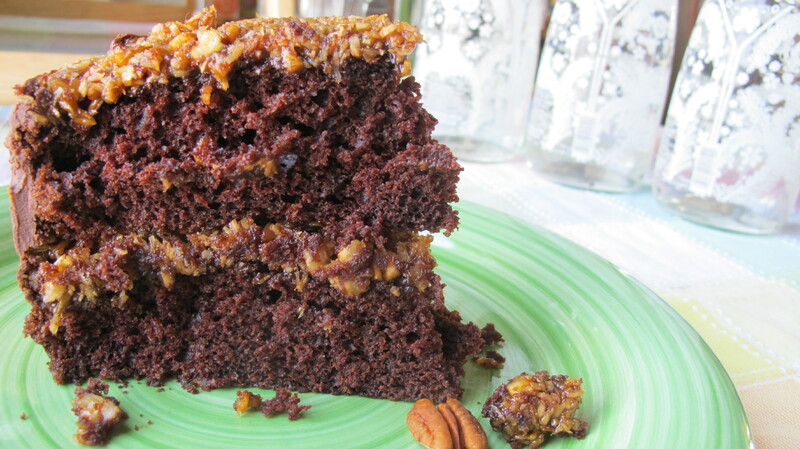 German Chocolate Cake was always one of my pre-vegan favorites. I have yet to have one as a vegan, so I will try this.